When you use BoardPaq to switch to paperless board meetings, you can dramatically reduce the amount of paper waste your business generates. However, this is not the only environmental benefit of using BoardPaq. We also have a company giving program in collaboration with One Tree Planted, a nonprofit organization that aims to increase the number of trees in our world today. Through this program, every BoardPaq free demo and paid subscription helps plant trees around the entire world. Find out how you can improve your board meetings and help us reforest the world by setting up your free BoardPaq demo today. Why Trees Matter to Our World. Every two seconds, humans destroy an area of forest the size of a football field. That is bad news for local wild animals, many of which depend on trees to provide food and shelter. Trees also play an important role in stabilizing the climate; according to statistics gathered by One Tree Planted, the world’s forests store 300 billion tons of carbon which, if released, could have a devastating effect on the balance of gases in the atmosphere. If humanity is serious about protecting our planet, it is essential that we stop cutting down so many trees and plant new forests to replace the ones that have been lost. At BoardPaq, this is just one of the many reasons we choose to make a difference by planting trees around the world. Less Paper, More Trees. Technological solutions such as BoardPaq make it easy to give up our reliance on paper. Every time you hold a paperless board meeting, you reduce the worldwide demand for paper, which in turn leads to fewer trees being cut down. You get to enjoy streamlined meetings during which all the information you need is immediately available, while the planet enjoys the benefits of reduced deforestation. Through our giving program with One Tree Planted, our customers have already helped us plant over 3,000 trees! People, Purpose, and Giving Back. As a company, we care passionately about giving back and making a difference. That’s why it wasn’t enough for us to develop a product that reduces the demand for paper. We also wanted to actively give back to a cause that helps make our world a better place. That is why we chose to partner with One Tree Planted to help us achieve our impact goals. Why One Tree Planted? Out of all the environmental nonprofits to choose from, we selected One Tree Planted because they are the leading voice when it comes to taking action on reforestation. Based in Vermont, they partner with businesses to plant trees in carefully selected reforestation sites in North America, Latin America, Asia and Africa. This reforestation provides habitats for wildlife and pulls harmful carbon dioxide from the air, replacing it with the oxygen we breathe. We Ensure We’re Doing Good RIGHT. We’re firm believers that doing good doesn’t make a true difference unless it’s done right. This is why we work with Good Meets World, an organization that helps businesses give back and make a positive impact on the causes they are about. Through this collaboration, now we’re doing more than just writing a donation check. We’re going above and beyond by spreading the word about One Tree Planted and the importance of reforestation to our customers and our social media audiences. The BoardPaq team is also walking the walk by volunteering throughout the year to plant trees in our home state of Missouri. By working with Good Meets World, we’re also a part of a thriving community of 70+ businesses that are giving back side by side. Help us Help the World. When you work with us, you’re making a difference. 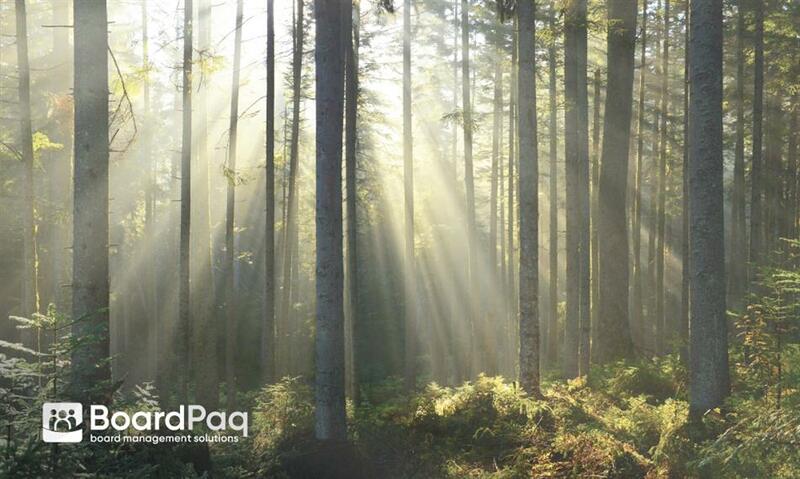 Your free demo and paid subscription to BoardPaq help to plant trees all around the world. You can help us make the world a better place by setting up your free BoardPaq demo today! In addition to the knowledge that you have helped us plant even more trees, you also get the benefit of streamlined paperless board meetings where the information you need is always available at your fingertips.